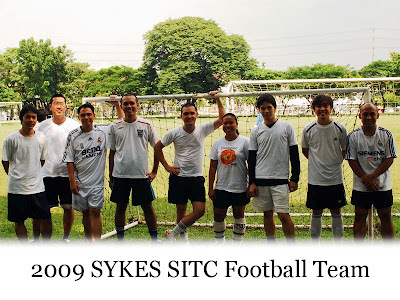 Last Sunday, I had the chance to play football again in the annual office football tournament. It’s a one day seven-a side mixed gender battle on the field where each sites’ representatives go against the teams from the other sites. This year, I played for a different team as our account had already been transferred to the farther part of the metro. But unlike the two previous years, I was the only girl in our team. My teammates may have changed but the fun and level of competitiveness had definitely upped its level. The tournament began with our team playing against the team from Cubao. In the first five minutes of the game, blood had already been shed as one guys from the other team accidentally hit his face against a guy from our lineup. He had to rest for a while and fortunately, everyone kept their cool. After another five minutes, another casualty had to leave the field – me! Some guy accidentally kicked the ball with full force straight at my face – hitting my two eyes and the upper part of the bridge of my nose. I was instantly blinded and I had to sit down for a few seconds. For about 20 minutes, my eyes felt like they were burning and I had to squint to be able to see. It was indeed an intense game as another foul committed by a teammate of mine caused a slight commotion in the field on the second or third game. Jeff had accidentally kicked the forehead of another guy which gave him two small bumps. It was a dangerous kick and was indeed foul-worthy. The guy yelled at Jeff inside the field. It was a good thing that Jeff didn’t fight back. We had a good laugh after it because of how it happened. Jeff delivered the kick as if he was doing kung-fu. Wahhahah! I wish I had a picture or video of it. The good thing was that Jeff and the guy eventually made up and shook hands after the game. Our team was eliminated after four games but I can tell that everyone had a great time and fought up to the extent of their endurance. Almost everyone were not in a good condition as some of us have not played in months or years. Before the game, some of my foreign teammates began applying some ointment for the joints – I guess they already knew they’d be needing it. Towards the end of the tournament, we were all muddy and one kid – who was the nephew of my teammates approached me and asked me, “Why are you so yucky?” referring to my muddy shirt, then he said, “You’re all yucky.” Thank God he was so adorable, I didn’t get offended. I just got a little surprised at the question. We were all yucky indeed, but if being yucky means being able to play football under the rain and get splattered with mud, then I prefer to be yucky. During one of our breaks, I got a little conscious because my fingers had a lot of mud in it but then I glanced at my teammates and saw that they were in worse condition than I was. At that moment, I felt so at home.